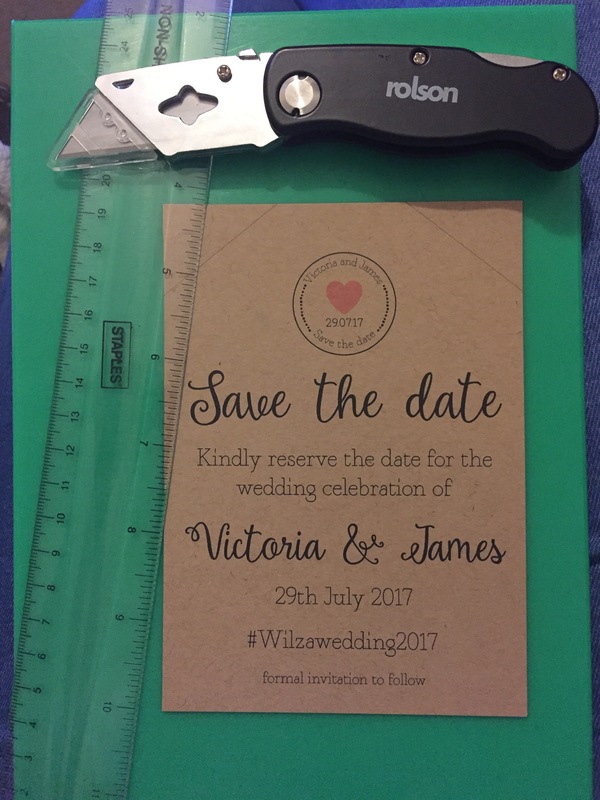 Although it’s a fairly new tradition in the UK, I always wanted to create a save the date for the wedding. With our friends and family spread far apart and some people in different countries, I wanted to try and make sure as many people could book time off for the wedding as possible. Luckily in my job I sit next to a very talented and lovely graphic designer who can turn ideas into amazing pieces of work. 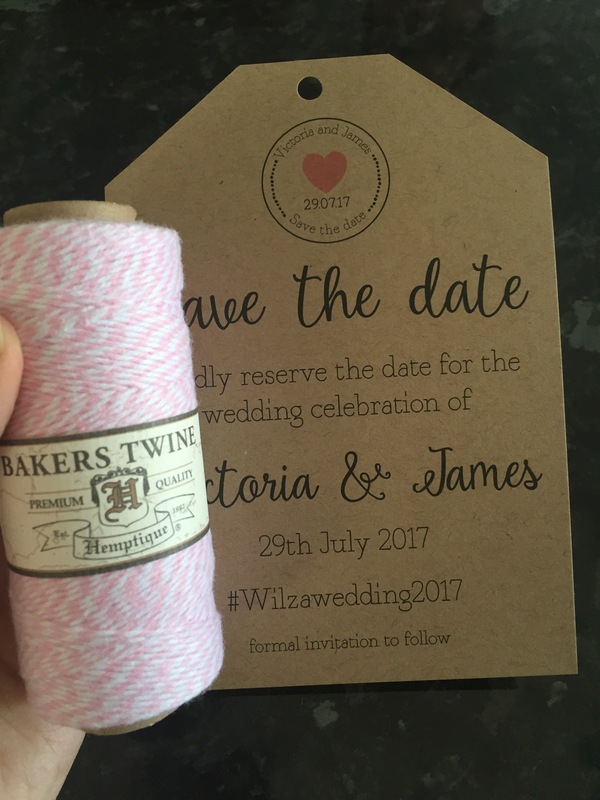 Laura kindly offered to help me create my wedding stationery and we spoke about things that I had seen in various places (Pinterest obviously) and what kind of colours and styles I was looking for. 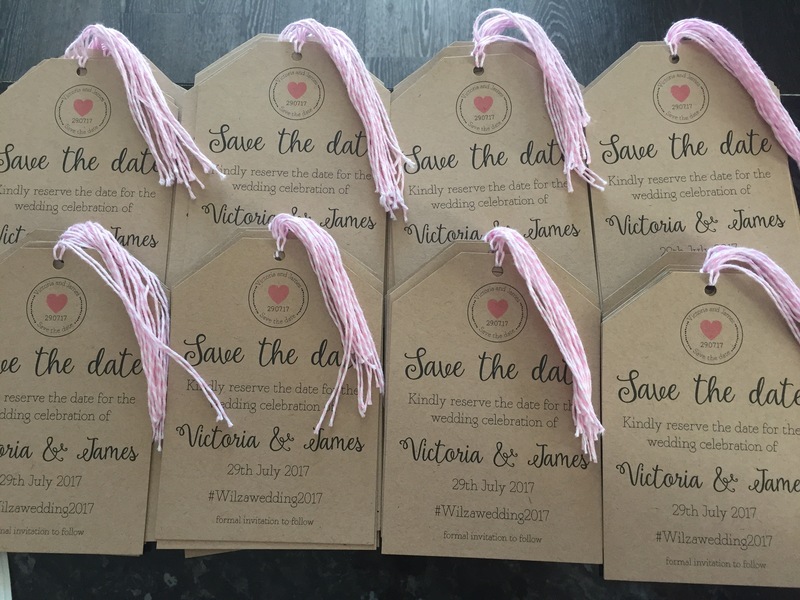 We came up with the idea of having a luggage tag themed save the date in brown craft paper matched with the colour of the wedding, pale pink. Laura did her magic and came up with a first draft of the tag, it was great. 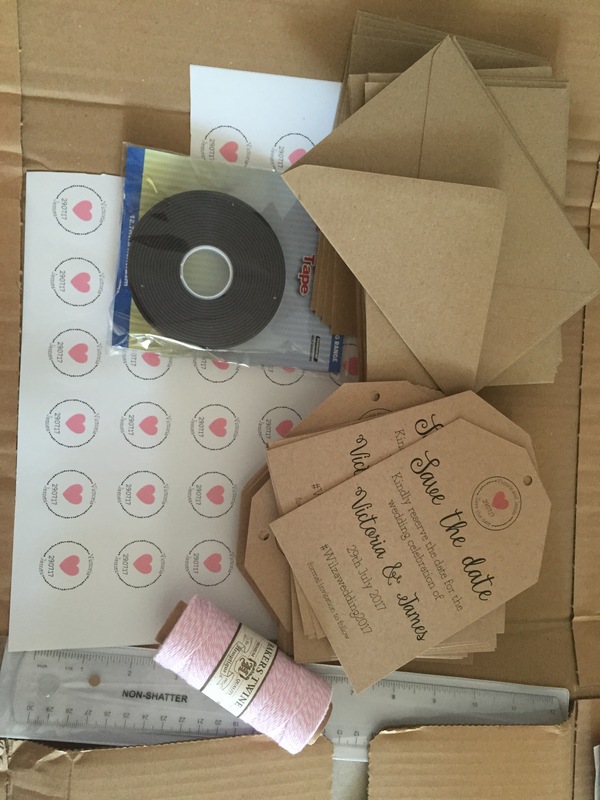 Not only is it really pretty but she has also created a little ‘logo’ for our wedding stationery to tie it all together once we have created other things like invites. Once we had made a few adjustments it was ready to be made. We looked at different options for printing and Laura recommended a website called http://www.printed.com where you can upload designs and have them printed at a fraction of the cost of using a stationer. 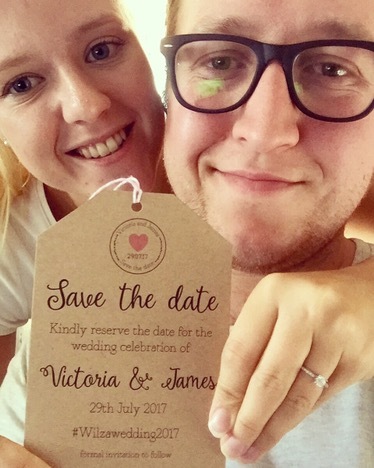 Luckily for me Laura did all of this as I was terrified of ordering the wrong sizes/colours or ending up with 3000 save the dates that would never be used. As I haven’t really done anything DIY for the wedding yet I thought we could make the save the dates even better by adding the finishing touches by hand. When the save the dates and envelopes came through the post they looked amazing and even better than I could have imagined. To finish them off myself and James had a little production line going; using a single hole punch to create a hole at the top of the tag, threading pale pink twine through so people can hang the save the date up if they want, adding a magnet to the back so people can stick it to their fridge, putting them in the matching envelopes and sealing them with personalised stickers that Laura had made using our ‘logo’. I’m so happy with how they have turned out, below are some photos showing the process of how we made them. After all that efficiency (this was months ago) I have only just finished sending them out and I’m pretty sure there are some still sat on my coffee table to be passed on when I next see people. 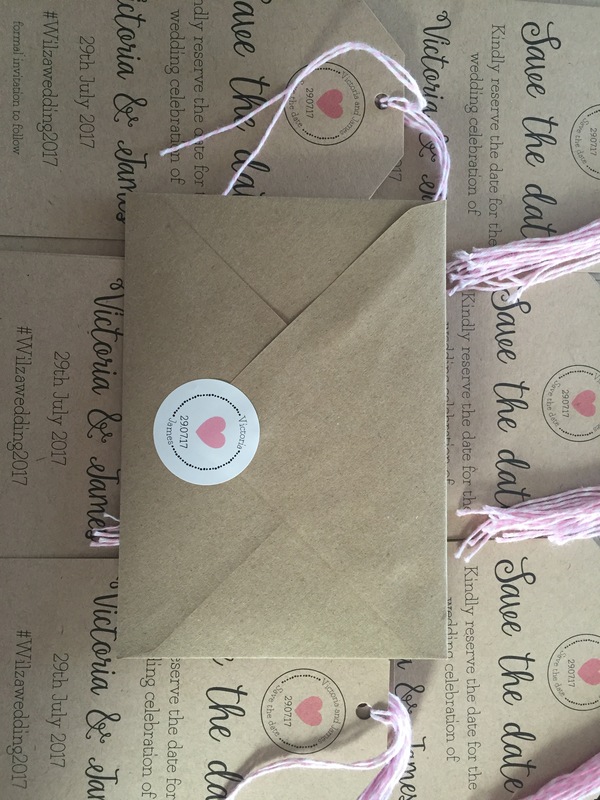 So if you think you should have received a save the date and haven’t, don’t worry, I’m just really rubbish at remembering to give them out, please don’t be offended! I’m sure you will get them at some point, hopefully before the actual wedding but I can’t make any promises, I am the hopeless bride after all. As we’re getting ever closer to the big day (232 days my countdown app tells me) I’ve started to look at the finer details of the day that need organising. Anyone that knows me knows that I have never been a very ‘girly’ girl, so when the checklist of things to do threw up makeup I must admit my heart did sink a bit. I’ve never been one of those girls that knows much about makeup, I have never owned a MAC lipstick (shock horror!) and up until a few months ago I’d never made any attempt to tame my unruly bushy eyebrows, mainly because all methods bloody hurt. At school I was too much of a nerd to worry about makeup and after that I never made it a priority. My makeup bag, which is very small, consists of my day to day products of concealer, foundation, eyeliner, mascara, a little bronzer and if I am feeling wild I may add a bit of lipstick, that is literally it. The thought of trying to communicate what I want on my wedding day is not going to be easy, mainly because I have no idea. Obviously I want to look nice on my day but trying to discuss lashes, colours and whatever the hell contouring is will not fill me with joy. So I did the usual, I googled, read tips on the ‘do’s and don’ts’ and generally procrastinated until something more interesting came along. What astounded me first of all was not only the choice on offer, but the price! As someone that buys very few products I had totally underestimated how much getting your makeup done on your wedding day would cost. I had quotes ranging from £90-£150 for what apparently takes between 30-60 minutes and obviously you don’t get to keep what they use on you. Am I the only person that thinks that is mad?? at that kind of hourly rate I am in the wrong industry! Luckily for me at the same time as all this was happening an old work colleague was taking the plunge in leaving a corporate city job behind in a quest to start her own business, as a hair and makeup artist! Unlike me, Alex always looked immaculately turned out with her trademark lipstick on and her hair looking amazing – thank god. I’d seen her talking about her business on Facebook and had looked at her website (www.verybettie.com check it out! )but had ruled her out as I had moved an hour and a half away from my old job. Weirdly not long after that, Alex got in touch and asked if I needed someone to do mine and the bridesmaids makeup for the day. I explained my situation and my location and was amazed that she was happy to travel and take on my 5 bridesmaids all on her own. I said to Alex that I have no clue what I want and generally need help (in life not just makeup) and she totally put my mind at rest and has made me feel a lot better about the whole thing. So Very Bettie is booked! she will be coming to do a trial for us all next year and will be joining me on my big day. I love supporting small businesses if I can, so please check out her Facebook (@verybettiemua) and website. Not only is she willing to travel but she charges nowhere near as much as the other people I researched, oh and she’s lovely which I think helps a lot!